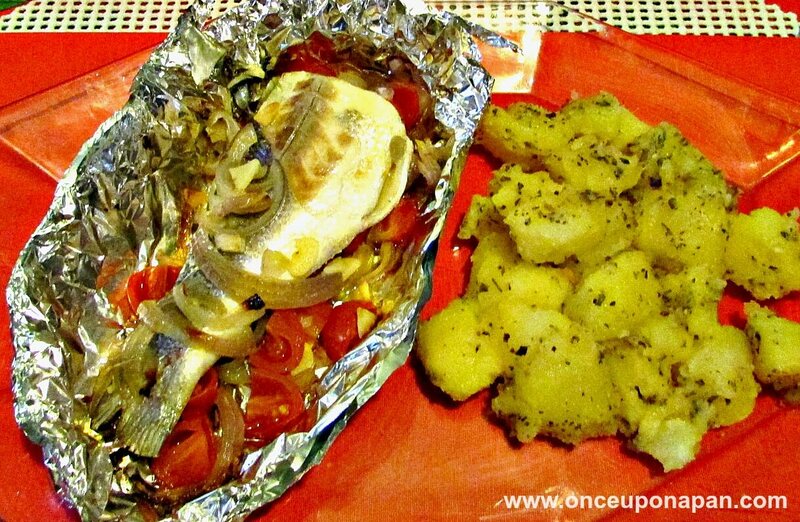 You can cook fish in many ways and a favourite of mine is wrapped in foil – particularly sea bass baked in foil 🙂 Mainly because sea bass is one of my favourite fishes and also because this way of cooking makes the fish even more delicious. Make diagonal cuts in the body of each seabass. Place garlic slices on each cut and season with salt, pepper and lemon juice. Cut the foil into 2 rectangles, each one large enough to wrap one fish. Place one fish on top of each of the foil rectangles. On top of each sea bass place the tomato, onion and coarsely chopped parsley. Drizzle with olive oil and close the rectangles of foil around the fish. Place both foil parcel on a baking tray and take to the oven for about 40 to 50 min. When ready, place the parcels on the serving dishes, open to let the steam out and drizzle with a little olive oil. Serve with boiled potatoes tossed in butter and dill.